You are moving toward the end of the race! In less than two weeks you will cross over the finish line and enter into a celebration for Easter Sunday! So today, I want to challenge and encourage you to finish strong! To really “go for it” for this last stretch in the Lenten Journey and cross that finish line with excitement and success! Perhaps you’ve fallen off the path. Maybe you got frustrated or unmotivated. 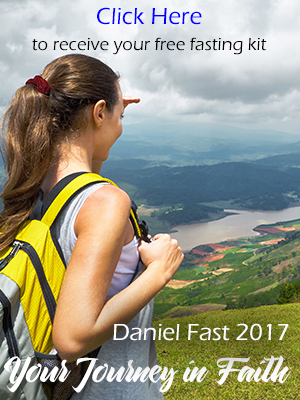 Maybe you encountered stumbling blocks and haven’t been able to stick with the Daniel Fast for Lent as you had intended. You may even feel like a failure. But remember this, you only fail if you stay down. You only fail when you keep limping along when you have the ability to pick up the pace and start running again! Eat according to the Daniel Fast Guideline every day between now and the end of the Lenten Fast (complete on Easter Eve) except for Sundays. Meet daily with my God and open my heart to Him and His Word. Will you join me? Will you shake off any apathy, mistakes, discouragement . . . and get back in the race? If you’re ready to finish this Lenten Fast with enthusiasm, strength and success, just leave your reply below! And then get up tomorrow morning with a new bounce in your step and let’s get running! Love and peace to you! I know you can do it! ← Are you ready for the “change points” in your life? So glad you are with us, Sandra. First, drink plenty of water! It will help you with hunger. Also, focus on the Lord. And remember, none of us are worthy. Only Jesus and praise God, He loved us so much that He gave Jesus to be the sacrificial Lamb so we can come boldly to the throne and be in His presence. It’s not our worthiness that let’s us be God’s chosen people. It’s Christ’s righteousness and because of Him we are pure, sanctified, holy and also righteous. I’m doing well Susan.. I’m staying strong.. I’ve been struggling for a long time. I didn’t think i could ever beat this problem with eating and drinking coffee.. Ever since i read your comment i knew God was speaking to me and i knew this is the time to do it.. I want to thank God for using you to help Gods children out in this world to become closer with Jesus.. Thank you again Susan. God bless u and your family. I’m going to win . It has been an awesome. I am so excited!!! I have been strong and I want to continue to be strong, thank you for all your encouragement. With God’s help I will finish STRONG. I have received so many graces and blessings this Lent through the Daniel Fast. My whole life has changed. My relationship with the Lord has deepened, and I have received many insights into the power of The Holy Spirit working in my life. Thank you Susan and may you and your family continue to be blessed. I will finish strong! I praise God that I have been able to be consistent with the Fast. I have not experienced too much temptation. Sunday was a challenge (I don’t come off the fast on Sundays) when I was invited to a banquet and was sure there would be vegetables I could eat – there was not a tossed salad without cheese, the summer squash had BACON bits in them … I settled for a plate full of ‘thawed’ fruit – and some of those tasty leaven-free corn chips (recipe from your book Susan) that I had stashed in my purse. I came home and ate like a horse … had made a sweet potato-black bean chili with quinoa (all DF ingredients). It tasted especially yummy after watching everyone around me eat giant shrimp and other non-acceptable foods. To God be the glory for bringing me THROUGH!